The intrinsically safe instruments F014P and F110P incorporate resettable totalizer 1 to 7 digits, a 11-digit non-resettable and an indicator of the instantaneous flow rate. 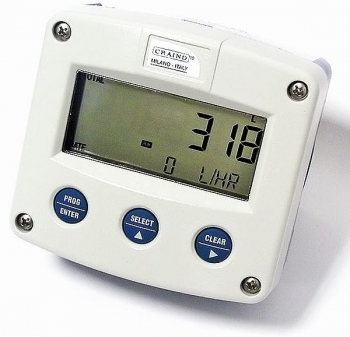 It is designed to be mounted directly on the flow meter or in proximity to it. It features built-in lithium battery that allow you to install it even in hazardous environments without the need for external power. In the version with output 4 - 20 mA an adjustable digital filter allows to obtain a better stability of reading. The built-in lithium battery allows the instrument a range of about five years, after which time the low battery condition will be shown on the display to the operator who will be able to replace it without difficulty. The instrument can be powered alternatively by loop 4 - 20 mA or via an external power source.